4 B 4 9th fretfr. 2 G 3 8th fretfr. 1 B 1 7th fretfr. 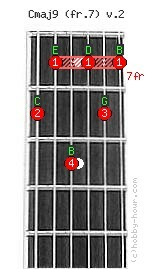 Chord Cmaj9 (7th fret) v.2 notes: C, E, B, D, G and B. C major 9th guitar chord's alternative names: Cmaj9, CM9, Cmaj7(9). 1(C), 3(E), 5(G), 7(B), 9(D).